In a medium size bowl, toss apples with sugar, flour, cinnamon, lemon juice, and water; spread evenly into a 8x8 inch pan. 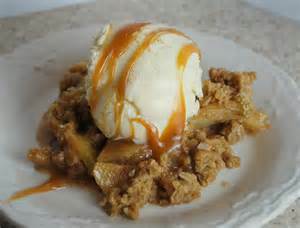 In another bowl, mix together flour, brown sugar, oats, and butter; spoon mixture evenly over apples. In a heavy sauce pan over low heat, melt the caramels with the evaporated milk. Heat , stirring frequently, until mixture has a smooth consistency. Drizzle the caramel sauce over the top of the crumble. The Perfect Fall Dessert! Enjoy!